Steeped in medieval history, The Périgord Noir is home to the many chateaux and towns such as Beynac, Domme and Monpazier one of the most picturesque and complete of the surviving Bastides. The Périgord Noir is also renowned for its hearty cuisine. A visit to any small market reveals the gastronomic delights of the region – foie gras, confit and magret of duck and goose, pommes sarladaise, cep mushrooms and truffles in season. The Department of the Dordogne provides the perfect opportunity for outdoor sporting activities, from outdoor garden karting, kayaking and wake-boarding championships to the arduous 100km de Belvès race held each April between Belvès and Sarlat which is challenge enough for any runner. Belvès’ own airshow, the 15th August fête aerienne is the perfect opportunity to view the forest of the Bessede from the air. Trips can be organised on Quad bikes, microlites, small planes and even by balloon to view this wonderful area from a different perspective. 2011 has the added attraction of the annual Felibree festival that is this year being hosted in Belves and will give a festival atmosphere for the whole summer. Medieval hilltop town, originally a Celtic settlement, overlooking the valley of the river Nauze with winding streets, medieval houses, 7 belltowers and a 15c covered marketplace. Tours of the Troglodyte dwellings provides an insight into the lives of its inhabitants during the 15th century.The Wednesday evening market is popular with our guests – bring your own cutlery and buy your food from one of the many stalls, or just sip a glass of rosé and enjoy the music. One of the most picturesque and complete of the surviving Bastide (fortified) towns, founded in 1284 by Edward I, King of England and Duke of Aquitaine. The market square has a covered market which still has the original medieval grain measures, and is surrounded by arcaded galleries. Our children recommend the pizzas at Chez Minou.The Chateau de Biron is nearby, and the Parc en Ciel just beyond (arboreal assault course) will test the most adventurous of kids. Another Bastide town built by Edward I – the English and the French really didn’t get on in those days! The EcoMarche on the Monpazier road is a good place to stock up if coming from Bergerac on the back roads. 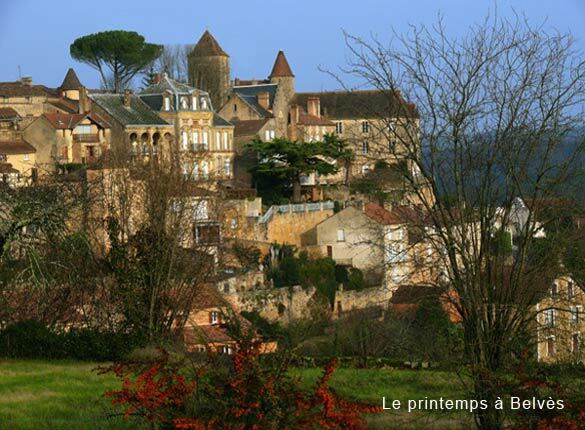 Spectacularly situated on a rocky plateau with stunning views overlooking the Dordogne river, this Bastide town was founded in 1281 by Philip the Bold of France to secure the border with English controlled Gascony. The town changed hands numerous times during the Hundred Years war and the Wars of Religion, and in quieter times became the home of writers like Henry Miller, who called the town the nearest thing to paradise on earth. The local restaurants aren’t bad either! Nestled by the Dordogne river at the foot of the spectacular Chateau de Beynac , which was captured by the English under Richard the Lionheart during the Hundred Years war, the steeply winding cobbled streets of medieval houses with lauze-covered roofs provide the the ideal place to tire energetic children while you sip a cool beer at one of the riverside cafes. Can get busy in the summer but the reputation of the old town is well deserved. An early start is recommended, particularly on Wednesday and Saturday market days. We enjoy wandering through the medieval streets in the evening and the tourist office arranges weekly candlelit tours during the summer. The caves in the limestone cliffs along the Vezere river which were used by prehistoric man as shelters for thousands of years have made Les Eyezies one of the richest prehistoric sites in the world. The French National Museum of Prehistory in Les Eyezies is definitely worth a visit.